Broadly stable national markets evident this week for most categories of cattle as a combination of lower throughput and slightly higher beef export prices put a base under the market. National trade steers the leader, given a boost by the southern states to post a 4.1% gain to 340¢/kg lwt. In contrast, heavy steers the laggard to see it down 2% to 288¢/kg lwt on some softer Queensland prices. 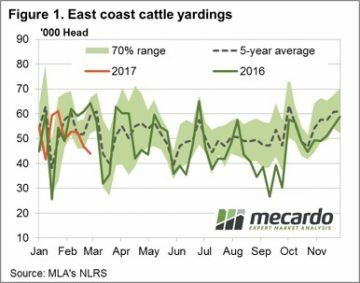 Figure 1 shows the east coast throughput tracking lower again on the week, despite a lift in Queensland yarding numbers, as the southern states start to restrict supply. The 43,900 head reported marginally softer than last week, but quite a bit lower than the same time in 2016 when just over 64,000 head were going through the east coast sale yards. 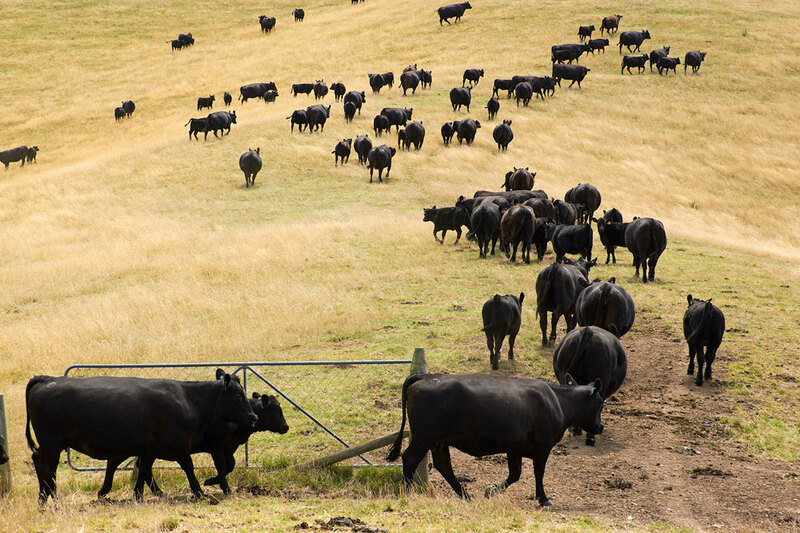 State cattle indicators mostly flat to slightly softer, although medium cow in SA and Tasmania taking a reasonable hit to see 24.2% (172¢’kg lwt) and 8.6% (201¢/kg lwt) declines, respectively. Victorian trade steers the top performer at the saleyards this week, up 4.8% to 334¢/kg lwt. Western prices softer across the board with pastoral cows mirroring the SA medium cow falls, down 25.5% to 168¢/kg, while the Western Young Cattle Indicator (WYCI) only marginally lower to 682¢/kg – a 2.3% drop on the week. 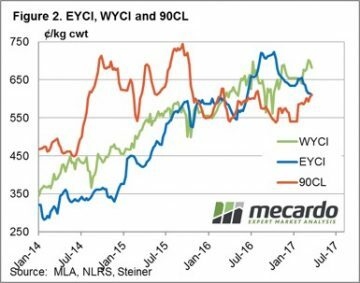 The Eastern Young Cattle Indicator (EYCI) reasonably stable, with only a 0.5% decline to close at 611¢, exactly where the 90CL beef export prices managed to finish the week – figure 2. 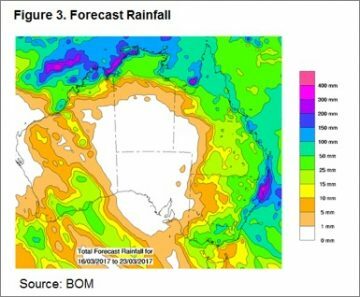 The 90CL on a par with the EYCI and the weekly rainfall forecast (Figure 3) showing some reasonable falls ranging between 10-50mm to much of the eastern seaboard should continue to underpin cattle prices. It may even encourage a further lift in the southern states as producers take solace from cooler temperatures as the Autumn starts to show its face.